"We now know more about dolphins and their care, and we believe that the National Aquarium is uniquely positioned to use that knowledge to implement positive change," said John Racanelli, chief executive officer of the National Aquarium. "This is the right time to move forward with the dolphin sanctuary." 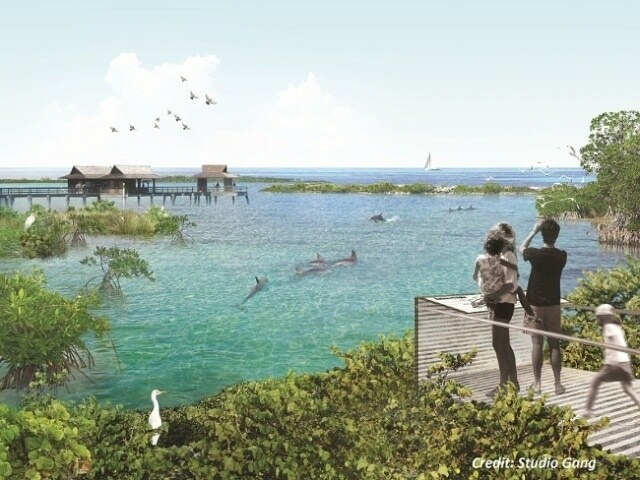 "We've evaluated this for five years and have decided that this is the right decision for the dolphins, and, thus, for our organization," said Aquarium board member Colleen Dilenschneider, who also served on a special board committee that assessed this project. "We are excited to introduce this new option along a spectrum of human care for dolphins." "This is a special time in history concerning evolving attitudes about treating all forms of life with dignity and respect—other humans very much included," said Sylvia Earle, marine biologist, explorer and author. "The idea of providing sanctuaries for elephants, chimpanzees, big cats—and now dolphins—is a sign of a maturing ethic of caring unthinkable in past millennia, centuries and even decades." "As we look at the future of the dolphins in our care, we are working very hard to provide them the best possible place to live out their years," said Tom Robinson, National Aquarium board chair.